Kittens Gone Lentil: VeganMoFo 2016 #14: Pretty in Pink? 14th: Monochrome meal – Make some food that is all based around one colour only. This week of coloured meals gave me no end of trouble, with many things really not turning out the colour that I had planned. Hmph! Oh well. So originally I was going to make a beautiful red soup for today. The photo in the cookbook was a gorgeous deep hue... hmmm... Not so much, it ended up orange with little bits of red in it. So then I decided to make a gorgeous pink dish, pink being my favourite colour after all. Pink noodles, pink sauce, pink beans... oh... how silly I was. I had bought some lovely pink beetroot noodles, and also decided to make a pinkish sauce using the Sun-Dried Tomato Cream Sauce recipe from Yellow Rose Recipes. And toss through some pinkish beans. First things first, the beans came out of the tin looking completely brown. Alas! My noodles as I cooked them ended up looking more reddy-brown than pink. Double alas! My sauce turned out quite nice a pink looking, and I even added a teeny bit of beetroot for maximum pinkness. I was starting to think maybe it would be OK! 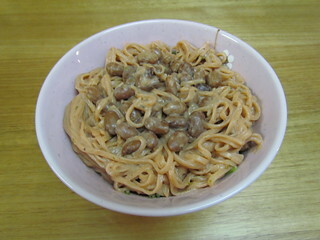 However, mixed with the noodles and the beans, the whole thing just turned into a shade of reddish-brown. So technically still counting as a monochrome meal, if not the colour I was originally looking for. And really, who doesn't love a meal of reddish-brown? Such an inspiring colour! Right? RIGHT? A note on the sauce, which was really easy. On it's own it was a teeny bit bitter, but once mixed in with some pasta it goes lovely. The sauce is blended up sundried tomatoes in a soy creamy base. I don't use oil packed tomatoes, so I soaked some semi-dried ones and used that. The recipe says it serves 2-4. I had 200g of pasta, and it was the right amount for that. So.... here it is. Brace yourselves. I have a super fancy camera, but I don't really know how to use all the features. The camera made it look even more reddish-brown that it already was! I tried a few things to make it take a pinker photo, but alas. I should really learn how to use it better. Check out my Instagram photo for today's prompt to see the amusing pink filter I put on it there! Oh well, so things didn't turn out the way I wanted. I still had some fun, and the end taste result was pretty great! Thankfully tomorrow's prompt will bring a bit more pinkness our way... with actually pink results! Here is a photo of a pink berry smoothie I made. 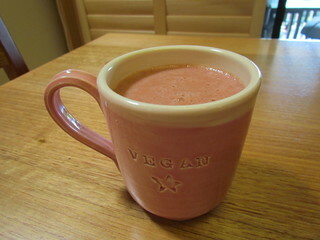 In my pink vegan mug (RIP mug, I broke the handle). Just so you know that I do know what pink is. Only my favourite colour. What is your favourite colour in general? Current day kitties. Could I love Dim Sim anymore? No. Could she be less impressed with this photo? Maybe not. What a beautiful mug! You have my sincerest condolences. The breaking of a mug is devastating business. Pink or not, I like the looks of that saucy pasta! I like your coordinating pink cardigan too. Is it pink? I think it's pink. It looks pink to me. Is it? Yes, I think it's pink. Pale rose? Dim Sim looks like she would like you to unhand her. Now. The color challenge is not really easy! We should make raw dishes to have more luck with the colors. I'd say black, grey, green and blue are my favorite colors. Raw would definitely keep the imagined colour in tact! As long as it was tasty, that's all that matters! :) Your pink berry smoothie looks good, too! 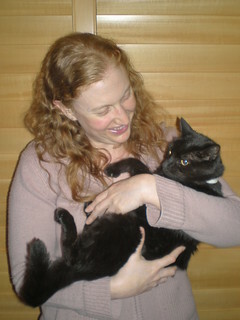 Awww, that photo of you & Dim Sim is so sweet; I used to hold Mystery like that & she loved it! Dim Sim prefers to be held like a baby, Sahara likes a little shoulder hug. Though Dim Sim was not preferring to be part of the photo shoot. My favourite colour is teal. If you were to walk into my apartment, you would see that right away with all of the accents I have all throughout the main area. That is such a cute pic of you and your kitty! I don't even have photoshop. Does that make me a bad blogger? I am also pretty lazy. I think a lot of people failed at this monochrome meal. XD I know mine didn't turn out how I hoped either. Pink is a hard color to recreate so you did a pretty good job!